Now that ABC anchor George Stephanopoulos has apologized for repeated donations to the Clinton Global Foundation, the question becomes: How much lasting damage will there be? On Thursday, in a written statement, he expressed regret for not disclosing the donations to his viewers or bosses. On Friday, he went a step further by publicly apologizing on "Good Morning America" and saying he shouldn't have made the donations in the first place. He added, "I should have gone the extra mile to avoid even the appearance of a conflict. I apologize to all of you for failing to do that." With the on-air apology, ABC is hoping the controversy will now begin to subside. But some powerful Republicans may not let it fade away. Republican National Committee chairman Reince Priebus called the donations issue "obviously troubling" on Fox News's "Hannity" on Thursday night. Most of the Republican candidates for president have stayed quiet about the controversy, but Rand Paul said on "Hannity" that "he's too close to the Clintons to really give an objective interview." Others disagree, asserting that Stephanopoulos has successfully transitioned from politics to journalism. Stephanopoulos said Thursday that he would not participate in ABC's Republican presidential primary debate, scheduled to take place in February, but would continue to cover the 2016 election for the network. An ABC representative said the network had no further comment on Friday. But journalists at other news organizations -- not to mention some inside ABC -- remain baffled. Why, they wonder, did someone as astute as Stephanopoulos decide to hand over money to Clinton's charity? How could he be so tone-deaf? Stephanopoulos donated $25,000 to the foundation for three years in a row beginning in 2012. While journalists like Stephanopoulos are generally free to donate to charitable organizations, donations to political groups and campaigns are ethically suspect. Many news outlets ban them outright. The Clinton foundation is one of a kind -- a hugely successful charity run by a political family that has become the subject of a sprawling controversy. Stephanopoulos has been covering that controversy, including through a tough interview of "Clinton Cash" author Peter Schweizer last month. After the donations disclosure, Schweizer accused the anchorman of a "massive breach of ethical standards." On "The Daily Show" last month, Stephanopoulos said that when foreign governments and other entities give millions to the Clinton foundation, "everybody" knows there's "a hope that that's going to lead to something, and that's what you have to be careful of." In a telephone interview with CNNMoney on Thursday, when asked to square that comment with his own donations, Stephanopoulos said "the scale there is quite different." His donations were measured in tens of thousands, not in millions. On "Hannity," Paul openly wondered whether the donations were "a payment for access" to the Clintons. Paul quickly added, "I don't know that it is." In the earlier telephone interview, Stephanopoulos denied that to be the case. 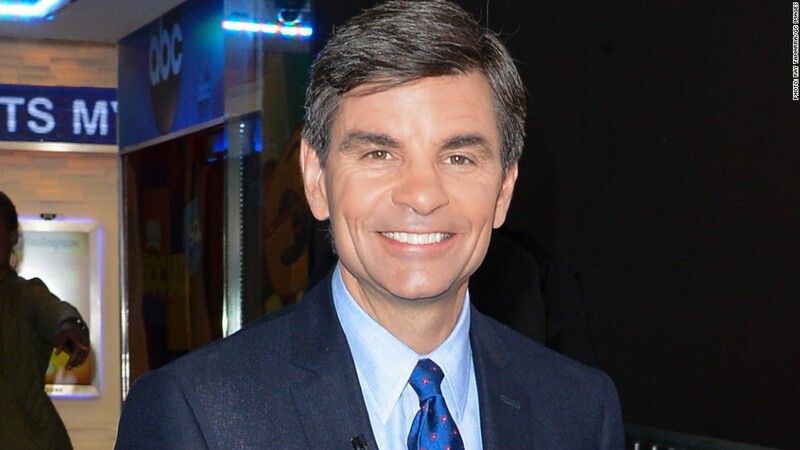 Stephanopoulos famously worked for Bill Clinton's White House in the 1990s before becoming a television news star. He said his only relationship to the Clintons now is a journalistic one. The donations were a matter of public record, which is a point he reiterated in his on-air apology on Friday. He started by saying, "I want to address some news you may have seen about me." "Over the last several years, I've made substantial donations to dozens of charities, including the Clinton Global Foundation," he said. "Those donations were a matter of public record. But I should have made additional disclosures on-air when we covered the foundation." He continued: "I now believe that directing personal donations to that foundation was a mistake, even though I made them strictly to support work done to stop the spread of AIDS, help children, and protect the environment in poor countries." Then "GMA" moved on to a weather report. But will ABC really be able to move on? Staffers at its main rival, NBC, are abuzz about the story. Politico's Dylan Byers, who was first to report on Stephanopoulos's donations, tweeted on Thursday, "Guess which broadcast news network is breathing its first, momentary sigh of relief in months?" He was referencing NBC, which has been on the defense due to its own anchor scandal, the one about Brian Williams' exaggerations. The Williams case is very different; nevertheless, the names of the two men have been linked by some conservative critics. Brent Bozell, the president of the conservative watchdog group Media Research Center, said Friday that "the most appropriate way for ABC to resolve this issue is by forbidding Stephanopoulos from anchoring any political coverage of the 2016 cycle or they will face the same integrity and ethics problems now plaguing NBC." Some media critics have also been sharply critical of Stephanopoulos. Politico's Jack Shafer wrote that "the donation corrodes much of the journalistic credibility Stephanopoulos has labored so carefully to accumulate since joining ABC News." He added, "By donating so handsomely to the Clinton Foundation, Stephanopoulos has handed the Republicans a cudgel that they won't stop using against him and ABC News until he exits the arena." Yet the criticism is far from unanimous. And the anchorman has close relationships to some prominent Republicans -- relationships that may matter a lot as he tries to recover from the self-inflicted wound. Stephanopoulos is well-liked and well-respected by some of the Republican candidates for president, which may partly explain why more of them have not weighed in on the matter. The candidates and their campaigns are also well aware that Stephanopoulos has a big audience, both on "GMA" and on the Sunday morning public affairs program "This Week." On Sunday he is scheduled to have the Republican leader of the Senate, Mitch McConnell, on "This Week." McConnell's office reconfirmed the interview on Friday morning. So far, there are no signs of an orchestrated boycott against Stephanopoulos or ABC by Republican leaders. CNN's Dana Bash contributed reporting.